As needed, refer to my season three post. Also, N.B. There are spoilers ahead. If you haven't watched through season four, anything you read below and didn't want to know is your own fault. Aidan Macallan, hired not only to spy on citizens searches, but also to analyze them, paraphrases to President Frank Underwood something I say often: "When they see (Conway), they see what they want to be. When they see you, they see what they want to become." Of course, this neatly covers a line by Nixon: When they look at him, they see what they want to be. When they look at me, they see what they are. In the fourth season, we see what the Underwoods have become: at its start a bickering, angry couple, but by the end, a couple that realizes, for their mutual benefit, that they must stick together. I wrote of last season that Underwood is limited by the office of the presidency and, as a result, we are limited as viewers to what he's stuck with. All the intrigue that made the first two seasons binge worthy made season three, where Underwood is President of the United States, feel trapped, locked in. As I wrote then, this was by design. While the outward appearance is that it "sucked," that's ultimately true of the Presidency: we lock someone into it for four or eight years in the hopes that they'll do what we as a group need them to do, what we ourselves are incapable of doing. In season four, however, Underwood has not changed in any significant ways (even after being shot) but has learned to adapt to the system within which he must exist. Indeed, he and Claire, who had all but broken up at the end of season three, understand now how they must use the system to their benefit, from using a dying woman in Texas to manipulating every aspect of the Democratic Party mechanism in order to make Claire Frank's running mate for the 2016 election. And indeed, it is impossible to view their 2016 election without the background of our election. Art, as ever, as able to obfuscate, and perhaps parallels are hard to find, but we can see one obvious one: the deceitful Underwood is able to manipulate by seeming to be the most honest, even if in their hearts, the people voting know he isn't. He forms a sort of plausible deniability: we know he's awful, but we didn't know just how awful he was. Could the same not be said of Trump? Of Clinton? On the opposite side, though, seems a near protege of Underwood's. The Governor of New York is just as awful, just as willing to do anything in order to get elected. However, whereas Claire Underwood is the Lady MacBeth to Frank's damned anti-hero, Conway's wife is new to this world. She's upset, she says, that Conway would be willing to sell her out. But she learns: she smiles when she realizes she will be First Lady (most likely). Where season five will go, I have no idea. A deck of cards has fifty-two cards and season five will put us at 53 episodes. The house has not fallen, though it seems poised to. But we know, of course, that Frank will find a way to survive. Frank will never be beaten because he is always ahead. At least we believe it to be so. Season four is strong. Season four doesn't have the intrigue of seasons one and two, but instead we have quick beats that keep the pace moving along. We are dealing with so many things at once that it hardly seems there is time to consider much at all. Is this not the Presidency in the modern world? As the voices of the two young men who have, in the name of Islam, killed the father of a family, their voices shake. But Frank's does not. Frank is fully in charge, even when things seemed to be failing for him. He's not worried about the dead man: he's worried about Frank Underwood. 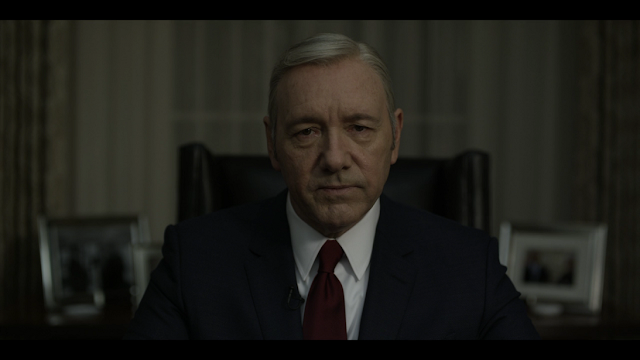 Underwood is not someone to root for, I wrote about season three. True: he's despicable. But I'm dying to see how he gets out of it— that's the joy of watching House of Cards. Ultimately, I can't help but wonder if he is marked. He must be. For all his wheeling and dealing, MacBeth could not see his own demise before him until it was too late. Is Underwood doomed to die? Would that not be the proper ending? After all, Urquhart is assassinated at the end of The Final Cut. What will ultimately cut Frank down? I think the answer has been in front of him the whole time.